Last week I had the privilege to attend an MIT forum and listen to the keynote address given by Nobel laureate Mario Molina. The subject of the address was the issue of conveying an understanding of the science of climate change to the general public. 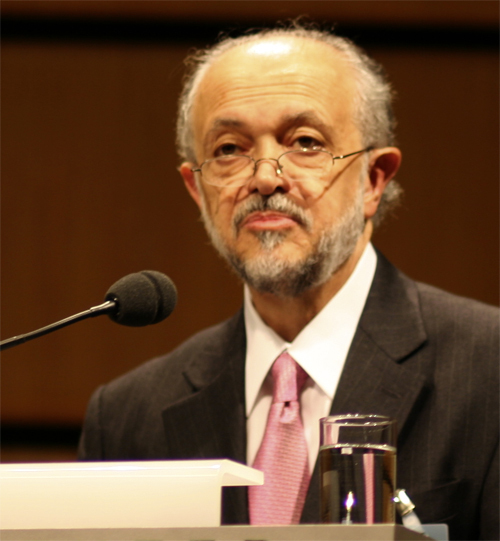 Professor Molina won the Nobel Prize and is best known for his work in identifying the role of chloro-fluorocarbons in the destruction of the ozone layer. Unlike the current state of paralysis that seems to be encompassing the international talks on climate change the Montreal Protocol, which underpins the global reduction in the use of CFCs, was negotiated with relative ease. But the nature of the problems are very different. Turning back to the keynote address, Molina lamented on the poor job that scientists had seemingly done in conveying what is, in his view at least, a relatively simple and well understood physical phenomena governed by a set of known equations. In addressing the audience, he asked quite simply in his soft understated tone “What is it about Planck’s Law and the Boltzmann constant that is now in dispute?”. 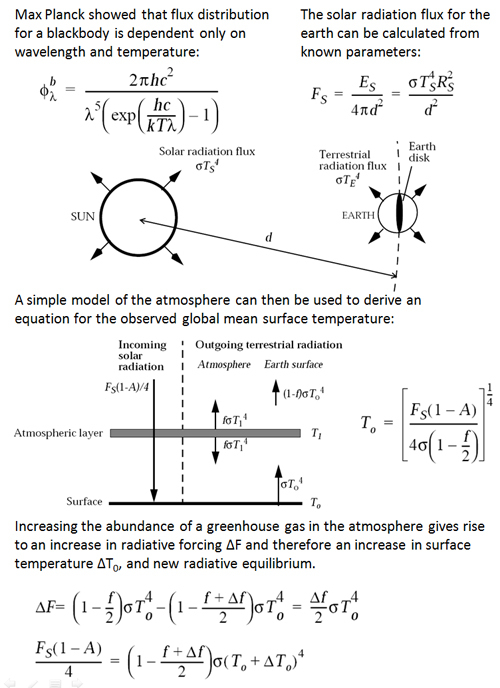 A similar question was asked for Kirchhoff’s Law and the other equations which can be used to calculate the observed temperature of the atmosphere, all of which have been developed over the last century and can be found in books such as Introduction to Atmospheric Chemistry, by Daniel J. Jacob, Princeton University Press, 1999. Most if not all of these physical laws were discovered for reasons unrelated to atmospheric chemistry, but of course can be applied to this discipline as they also can to explain a multitude of other physical phenomena on display in the world we inhabit. In fact none of this basic physics and chemistry is in dispute – if it were then we shouldn’t be surprised that a multitude of the devices we use in everyday life, from iPad’s to microwave ovens, wouldn’t work as expected – or in reality wouldn’t exist in the first place. All depend on the same physical principles that also make up our understanding of the workings of the atmosphere and the impact of a change in its composition. Yet time and again we are confronted by commentators claiming the issue is a hoax and the science is fraudulent. This played out again in Australia over recent days as British climate sceptic Christopher Monckton toured the country and delivered a series of lectures. Professor Molina didn’t have a solution to this problem, other than to recall the successful transition from initial scepticism to eventual action and international agreement on CFCs. He noted that this was to some extent down to the role of business as new refrigerants were developed to replace CFCs. Unfortunately the climate problem is an order of magnitude or two more complex than the ozone layer issue, given our near total reliance on fuels and industrial processes which emit CO2. The issue also runs headlong into the sensitive issues of energy dependence, human development, economics and national security, further complicating the solution set. But we could at least start by recognising that physics and chemistry are part of our lives and that the society we have built depends totally on the laws, constants and algorithms that have developed from these disciplines, which includes our understanding of the processes in the atmosphere. Then perhaps there is room for a more grown up debate on the way forward. The USA on target? Yes, according to the Administration! Well, there is a problem with above science. Although the real Earth greenhouse effect is more complex than described, not many skeptics are disputing the greenhouse effect at all. The main argument of skeptics is about the water feedback which is (in opinion of IPCC) the dominant cause of the anthropogenic global warming of the Earth. If we want to go to the core of the problem then we should discuss dynamics of the atmosphere, energy budget and ocean heat content. Unfortunately, even the simplest laws like Planck’s law have bad habit to exhibit incredibly complex behavior when applied onto complex systems. It’s is not surprising that climate models are very often surprisingly poor in replicating the real world measurements. So let’s discuss some prominent skeptic like Prof. Lindzen or Dr. Spencer. I think that addressing some of their concerns would be far more beneficial than reinventing secondary school textbooks.